One of the ways experts gain credibility in their industry is through earned media. However, when an expert isn’t properly vetted by a journalist, the credibility of that outlet is put in jeopardy. 1. What educational degrees do they have? Though many people take a different career path from their original field of study, a degree in a field of study such as medicine or law is one way to ensure that your expert has a reputable background in your area of interest. 2. Is the expert in question associated with a legitimate company? Working with a free agent poses some risks with regards to the credibility of their statements or identity. However, if an expert is listed in association with a company or other verifiable organization, this can serve as proof that the expert is who they claim to be. To verify the legitimacy of a business, you can search for the company’s state and federal online business registrations on the IRS website or the Better Business Bureau. 3. Are there inconsistencies or discrepancies in their career timeline? For many employers, gaps in a candidate’s career history indicate a lack of experience. The same reasoning should more or less be applied to an expert. For example, if the expert was inactive during a critical period of change for their industry, they might not have the credentials needed to comment on certain issues. 4. Has the expert previously made factually inaccurate statements? CNN reports that Simmons regularly made factually inaccurate statements regarding national security. Fact checking the claims made in past media appearances can alert you to whether or not that source is trustworthy. To help you locate academic sources that support major claims, the “Ask a Librarian” feature on the Library of Congress website allows you to submit a request for information and receive a response via email. Sites like FactChecker.org or PolitiFact.com can help you verify political statements. On tight deadlines, fact-checking a source may seem like a tedious extra step, but if your reputation is at stake, taking the time to verify a source is well worth the effort. Another option is to submit a query through ProfNet, which verifies that subscribers are associated with legitimate companies before they are available for comment. Click here to submit a query. How do you vet experts you work with? We’d love to hear your advice in the comments below. 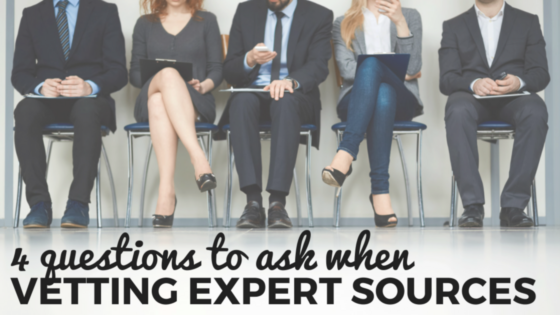 Whether you’re a reporter, blogger, author or other content creator, ProfNet can help you with your search for expert sources. All you have to do is fill out a quick form telling us what you’re looking for, your deadline, and how you want to be contacted, and we’ll send it to the appropriate experts in our network. The best part? It’s free! Get started here. Shannon Ramlochan is an Audience Content Specialist for ProfNet, a free service for writers seeking experts for their stories. Follow her on Twitter @sramloch.